So far we’ve made more than 40 overland border crossings with our truck and we’ve gotten pretty good at it, if we do say so ourselves. 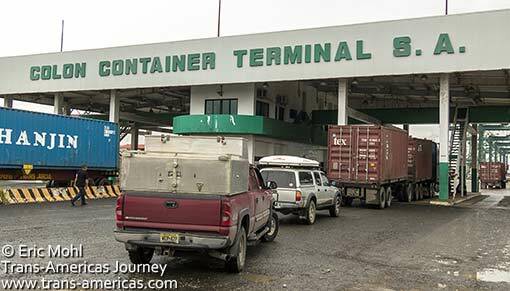 However, nothing prepared us for the rigors of the most complicated overland border crossing in the Americas: shipping our vehicle around the Darien Gap in order to get from Panama to Colombia. What is the Darien Gap? Oh, nothing….Just a swath of road less jungle between Panama and Colombia which creates the only break in the Pan-American Highway. It’s essentially impossible to drive through the Darien Gap, especially since we didn’t splurge for the Chitty Chitty Bang Bang package on our truck (hindsight). So, our only option was to ship our vehicle from Panama to Colombia on a boat. A very, very big boat. A container ship to be exact. 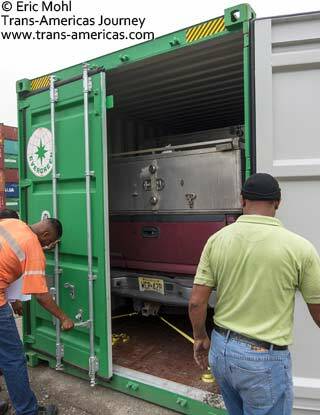 In June of 2012 the good folks at Life Remotely put together a comprehensive two-part series of posts that do an excellent job of detailing the vehicle shipping process in Panama and the vehicle retrieval process in Cartagena, Colombia. If you are shipping your vehicle we urge you to study these useful, pleasantly pedantic tomes and even print them out for in-process referral. We did. Just bear in mind that some details, including fees, can and will change. 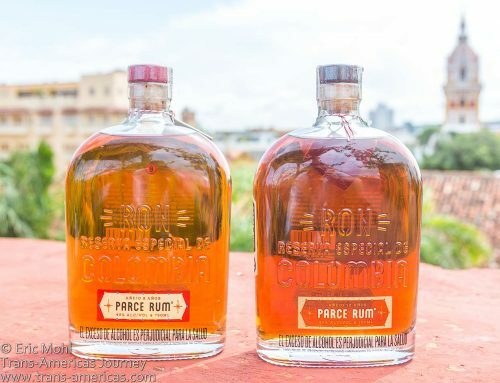 With that in mind, here are some additional border crossing 101 travel tips, tidbits and up-to-the-minute details based on what we encountered when we shipped our truck from Panama to Colombia. Our truck lines up with the big boys to enter the busy and grungy Container Terminal in Colon on the Caribbean coast of Panama where it began its complicated journey to Colombia. The Toyota Tacoma in front of our truck belongs to our shipping partners George and Teresa. That green shipping container would be “home” to our truck and the Toyota Tacoma it was sharing space with for the journey from Panama to Colombia. Lay of the Land: If you think overland border crossing points are desolate, dirty, labrynth-like wastelands they’ll seem like the Garden of Eden in comparison to the filthy, crumbling, chaotic Colon Container Terminal in Panama (the port in Cartagena where we retrieved our vehicle was much cleaner and more organized, by the way). 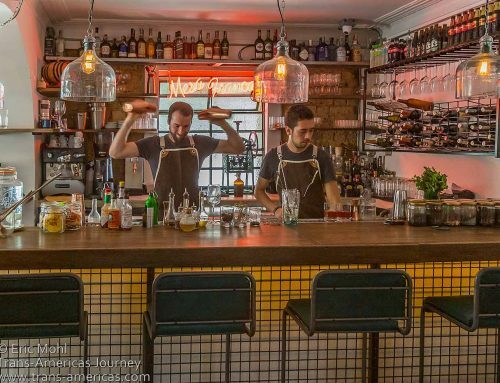 Not to mention the connect-the-dots of customs and immigration offices you’ll be running around to, knees buckling under a fresh load of red tape and paperwork. The most mind-boggling experience, however, will likely be the moment when you drive your beloved vehicle inside a steel shipping container. 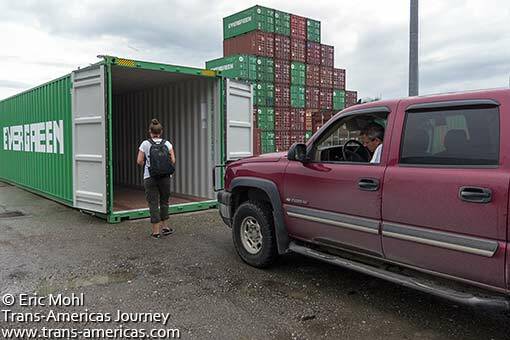 Despite measuring and re-measuring the dimensions of our truck and the dimensions of George and Teresa’s Toyota Tacoma, which we were sharing a 40′ container with, there was a scary moment at the port when we thought the two vehicles might not fit in together. 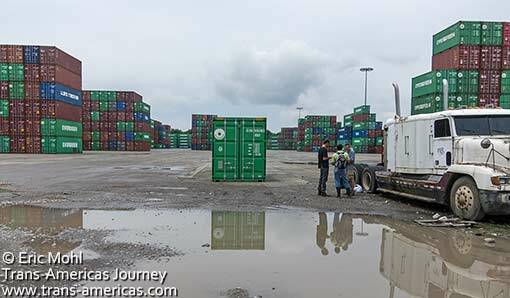 Don’t miss our time-lapse video at the end of this post to watch our trip into the container in Panama and back out again in Colombia. Will our truck fit inside this shipping container? For a few scary moments we thought our truck was not going to fit into this 40′ shipping container along with the Toyota Tacoma belonging to our shipping partners George and Teresa (pictured above with Karen), but we finally made it work. 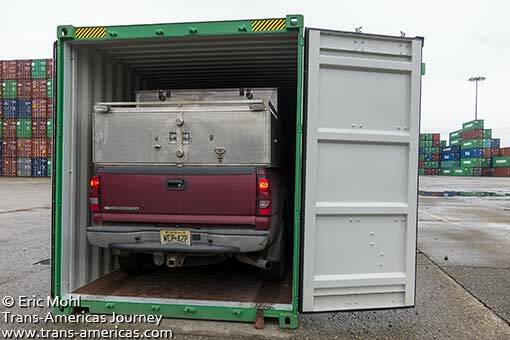 Eric inches our truck inside a 40′ shipping container in the Container Terminal in Colon with mere inches to spare. Despite manic measuring of both vehicles prior to “stuffing” them into the container we had to wiggle and inch the trucks forward in an intricate ballet to insure that the back door would close. See what it’s like to “stuff” and then “unsutff” a very large truck into and out of a marginally larger container in our time-lapse video at the end of this post. Our truck was also a tight squeeze width-wise which meant that once inside the container the truck’s doors would not open. Eric had to squeeze out his open window and slither up onto the top of the truck, then over the cargo box and out the back door of the container. Our truck made it inside this shipping container with just inches to spare which meant Eric had to get creative when it was time to get out of the truck. 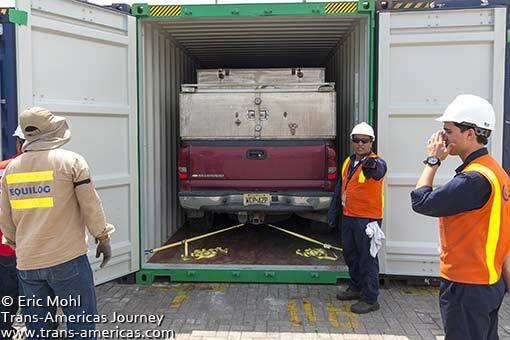 The doors close on our truck and its journey from Panama to Colombia begins. Fees: Fees, as we’ve noted, are subject to change and fluctuate based on currency rates. Additionally we had taxi/bus costs of about US$28 to get from Colon back to Panama City after stuffing the vehicles, and nearly US$50 in transport costs over the three days of running around to offices and the port in Cartagena for a total of US$78 which was split between vehicle owners. Number of days they gave us: In Colombia we received a free temporary importation permit (TIP) for our truck that’s good for 90 days which matches the free 90 day tourist visa we were given. 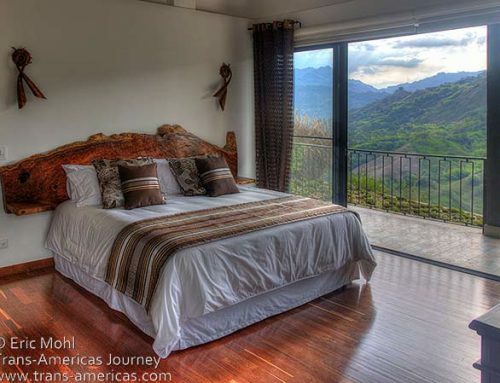 Our visas and the truck’s permit are extendable for an additional 90 days. 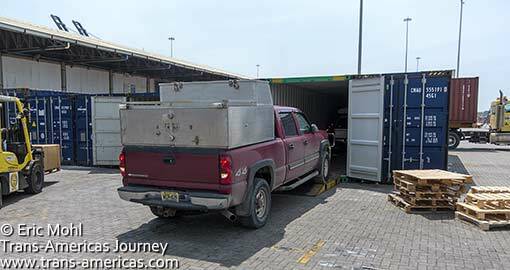 Vehicle insurance requirements: We were allowed to drive our truck out of the port in Cartagena to a local parking lot without any local insurance at all. However, to drive any more than that you are required to buy local insurance which is priced based on the size of the engine and the age of the vehicle. We paid US$68 for 90 days of coverage for our eight cylinder truck that was built in 2007. They will only sell you insurance for the duration of your current valid temporary importation permit. Insurance, called SOAT (Seguro Obligatorio de Accidentes de Tránsito), is sold across the country at banks, supermarkets, gas stations and other retailers. SOAT prices are set by the government and are the same everywhere. Where to fill up: Fuel is a bit less expensive in Panama. However, you are only allowed to have your fuel tank 1/4 full when it’s loaded into the container. If your fuel tank is more than 1/4 full officials can impose a US$250 dangerous cargo surcharge, though nobody in Colon checked our fuel levels. 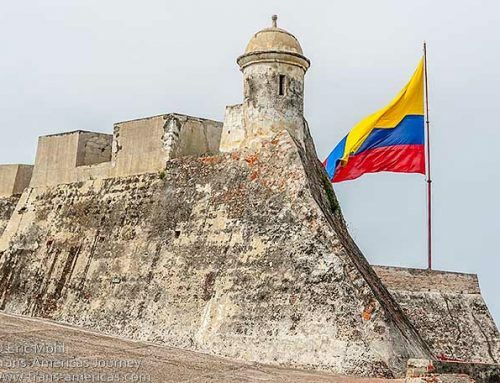 Remember that you will need proof of accidental death and dismemberment insurance to enter the port in Cartagena. 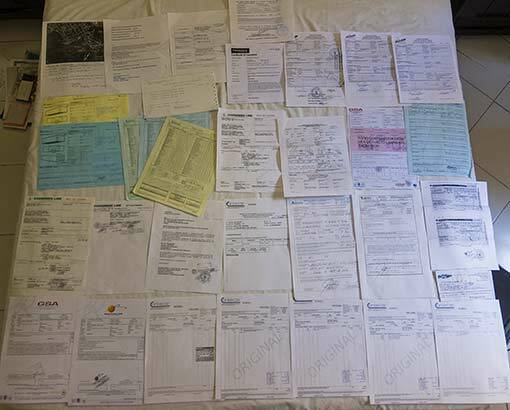 Like many long-term overlanders we’ve given up our US medical insurance since the expense was ridiculous and it provided no coverage in the countries we are traveling through. We got around this little hurdle by jury-rigging a policy and port officials didn’t bat an eye. Tie-downs are part of the service your shipping agent in Panama provides, though the tie-downs used on our truck were pretty flimsy. 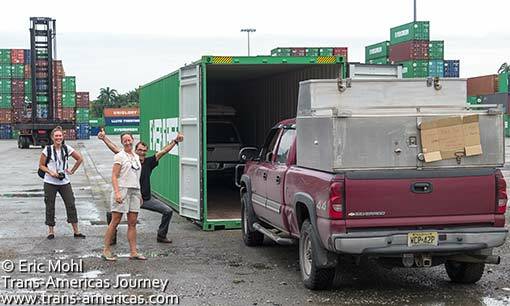 Easy, easy…Our truck emerges from the shipping container it spent days in crossing the “land” border between Panama and Colombia around the Darien Gap. We looked into RoRo (roll on/roll off) and LoLo (load on/load off) shipping options as well but both were more expensive than putting the truck into a container so that’s the method we ultimately chose. We’d also heard security concerns from people sending their vehicles RoRo/LoLo since you must leave your keys with ship staff. The containers get boiling hot so don’t leave any electronics, batteries, CDs, food, etc. inside your vehicle. It’s all gonna get cooked. The containers are sealed with an official plastic device that did not look very strong. Though our container arrived untampered with, if you want added security, bring your own pad lock. 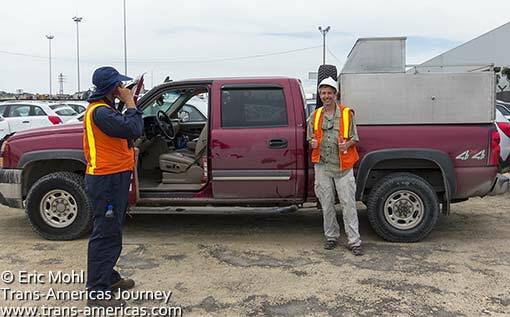 After days of paying fees, filling out paperwork, and organizing inspections in Cartagena our truck was finally released to Eric at the port and we were ready to begin our little road trip through South America. 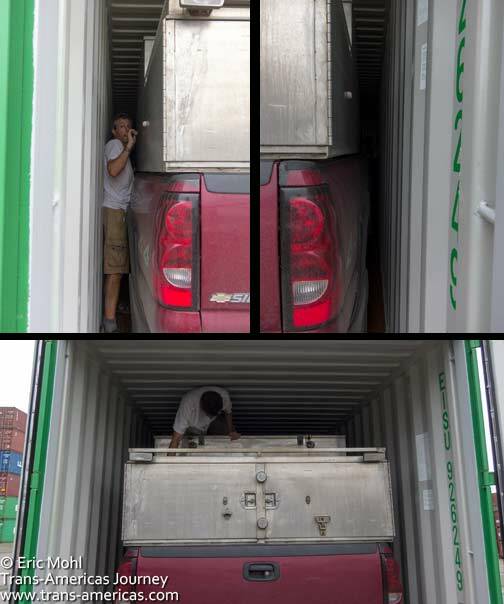 Part of the service provided by our shipping agent is to tie down your vehicle inside the container. The tie-down straps used on our truck were new but far too weak for the job. Had the container encountered any serious rocking our truck would have easily snapped the tie downs. If that makes you nervous, bring your own beefier tie downs. Be sure to put your emergency brake once you’re positioned inside the container and turn your alarm off. You don’t want it going off mid-journey and sapping your battery. For some reason there is no additional charge to get a “high cube” which adds a foot (0.3 meters) of height which was necessary to accommodate the cargo box built into the bed of our truck. When measuring the fit of your vehicle be sure you’re working with the entrance/door measurements (door aperture) which are slightly smaller than the interior dimensions. Cartagena officials never stamped anything into Eric’s passport regarding the truck. It’s documentation is totally separate. 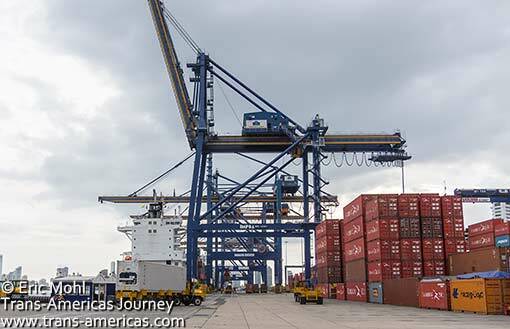 We chose not to pay a shipping agent on the Cartagena side to assist us which mostly worked out fine but we did get lost at the port a few times as Karen and Teresa (our shipping partner) demonstrate, above. 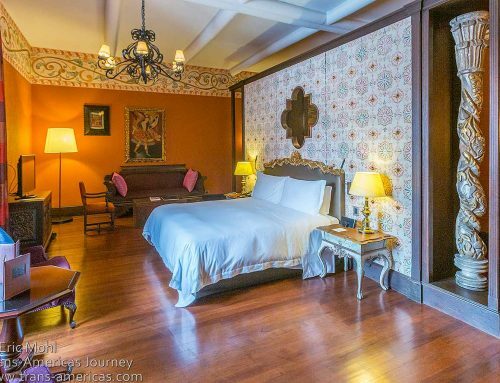 We handled everything in Cartagena without an agent and got by just fine. This is obviously easier if you have some Spanish since all of the officials and forms we dealt with were strictly Spanish-speakng except for David of Global Shipping, the Evergreen Shipping agent who received the container in Colombia. 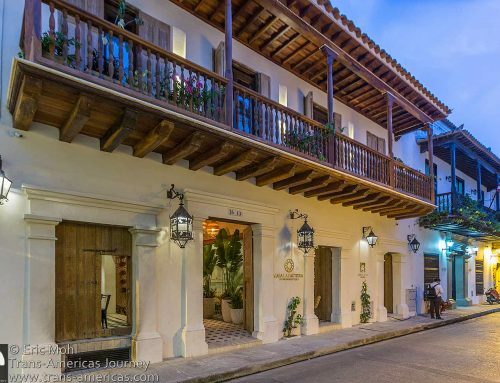 If you feel more comfortable engaging an agent on the Cartagena side to assist you we can recommend an agent named Manfred. We met him by chance and he generously gave us valuable advice and insights for free and even offered to help out via telephone if we got stuck at any point along the way. Manfred’s cell phone number in Cartagena is: 311 400 6394. You have three business days after arrival to “unstuff” your vehicle (remove it from the container) and complete the paperwork necessary to drive your vehicle out of the port in Cartagena. The charge for leaving your vehicle at the port beyond those three days is about US$4 per vehicle for the first 7 days once it’s unstuffed which is cheaper than the most affordable parking lot we were able to find in Cartagena which was about US$9 per day. The fee imposed on vehicles left inside containers is much higher. If, like us, you decide to share a container with another vehicle (which you will want to do because it cuts many of your costs in half) note that both drivers must go through the “unstuffing” paperwork process in tandem. However, only one driver is allowed into the Cartagena port to oversee the unstuffing of both vehicles. 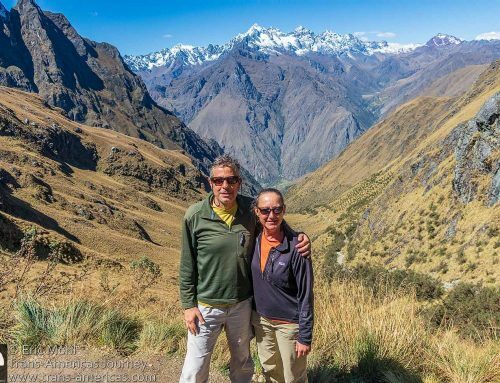 To find a shipping partner we suggest posting your need in the appropriate forums on Drive the Americas and Expedition Portal. 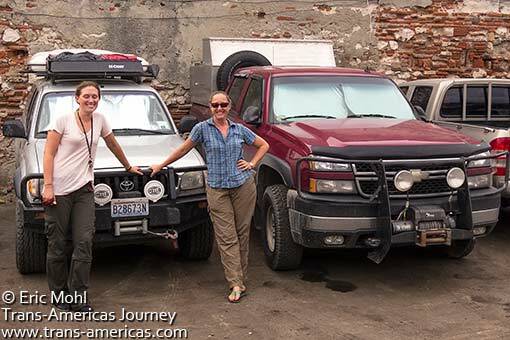 Teresa and Karen wearily celebrate on the day our two trucks were cleared and returned to us in Cartagena after nearly two weeks of paperwork, inspections, stuffing, unstuffing, and an epic boat ride from Panama to Colombia. Duty free finds: There is no duty free. Overall border rating: Crossing the border from Panama to Colombia (or vice versa) with a vehicle is, officially, the most complicated and expensive overland border crossing in The Americas. 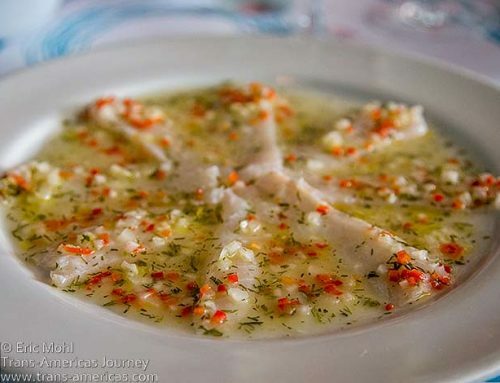 To live vicariously (sicko) or get a head start on the shipping process, check out our time-lapse video, below, which takes you through the entire process from stuffing in Panama to unstuffing in Cartagena. Thanks to everyone who contributed to our Tip Jar to help cover the cost of shipping our vehicle from Panama to Colombia. You were with us all the way. 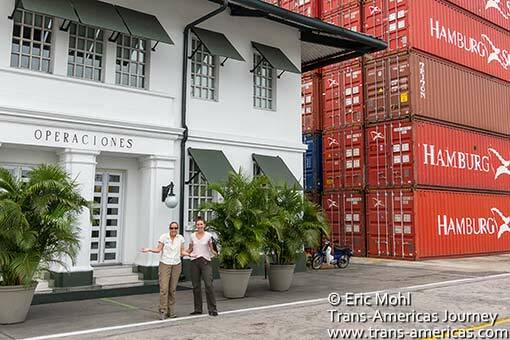 We didn’t have to make the journey from Panama to Colombia in a shipping container, but we did have to get on boat. Check out our San Blas Island sailing adventure that got us from Panama to Colombia. And if you know of an even more complicated overland border crossing between two adjoining countries, tell us all about it in the comments section below! Wow! Informative post. It all sounds very daunting. We would like to drive south in a few years, but I’m not sure we’re up to it. Thanks! Cool! I considered doing the trip from Chile to the US. Never did it but in doing research I learned about the “small” Darien Gap issue. Neat to read about someone who got it done – congrats! This a really awesome blog post, and actually quite comprehensive. The blog spells adventure. Although I understand completely what you went through I do recognize the importance of mentioning that although you may have gone through a lot of bureaucracy, in the end your items inside the vehicles were all there. Had this been from the US to Costa Rica you might not have been so lucky like many before. None the less…sounds like it was a fun trip and I am pleased you documented your small adventure. I’m sorry Don, I don’t understand what you are referring to. I haven’t heard reports of theft from a container with vehicles being shipped from anywhere in the Americas so long as the container was loaded at the port and sealed by the shipping company. RoRo is another story however. I’m sure containers full of more marketable commodities such as shipments of TVs and other electronics are much more attractive than a few assorted contents left inside a vehicle. Well thats good to hear however here even if thats the scenario things seems to go missing upon arrival here in CR. It has happened to a handful of my friends. Missing from inside vehicles being shipped, or from a container of items being shipped down? From within the container within the cars. Typically it happens here on this end before you even see the thing they open it and “inspect” it. Interesting, we never heard any reports of that. Not sure how that happens since the container is sealed with a unique, shipping line tamper-proof seal, and you can put your own locks on the outside of the container. Once beyond that, one would then have to break into the vehicle since they don’t have the keys. This would all surely be pretty evident from the outside of the container before it was unsealed and if that’s the case the shipping company has liability as as far as I know. They are not responsible for damages, etc, but are responsible for negligence and and gross mishandling. The official seal being removed would fall under negligent handling of the container, let alone all the other steps necessary…I believe. Making a claim is of course another story. Looking at the photos I did wonder how Eric was going to get out of the truck – good thing he’s not tubby! BRAVO ! Good for you all. And thank you SO much for documenting this so well. Personally, I’ve driven U.S. to Panama twice…and all those border crossings are enough for me ! But, I HAVE to save this article. 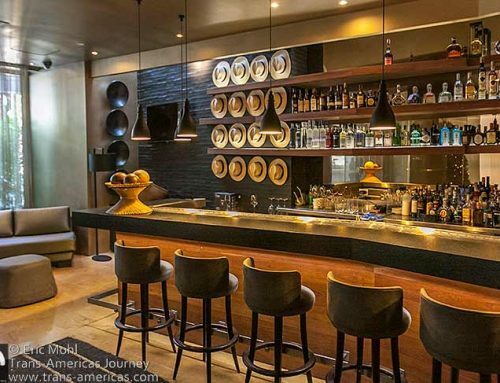 Wow, you know how to pack the heck out of a shipping container. Shipping around the Darien gap sounds like an incredibly stressful and complicated process. Thank you for putting together such an informative post. 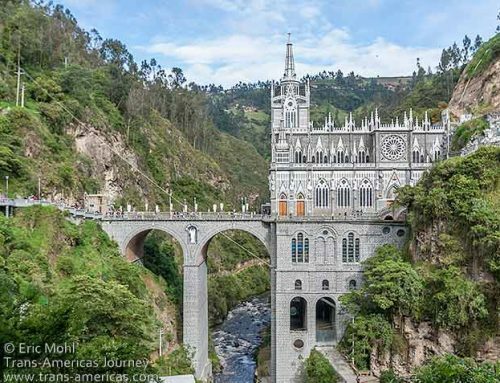 My wife and I are thinking about making this trip . . . do you know if the ferry you mentioned is running yet? Moving from one place to another is such a hectic job. If we do not choose the right shipping company, we may have to face many problems. Your post gives a perfect idea of every situation one may have to face during that long shipment process. And those travel tips were really great and helpful. This is a bit scary… how did you find a partner to share the container? Is there a group or something where people get connected? Thanks for the very informational post! Don’t be scared! Just be prepared. 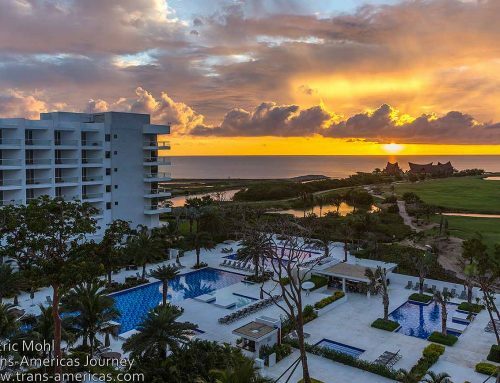 Check out a website called Drive the Americas to find a shipping partner. They have a forum specifically for container sharing. 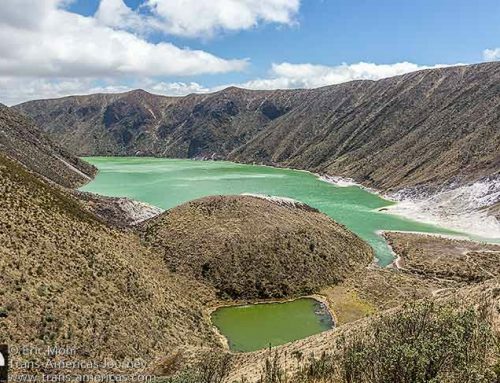 Also, there’s a Facebook group called PanAmerican Travelers Association which is full of overlanders. It’s very active and helpful and if you’re not already a member I’d suggest requesting membership. 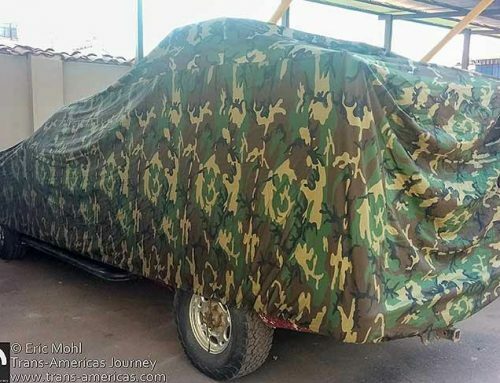 There are often other overlanders looking for shipping partners there. Good luck! 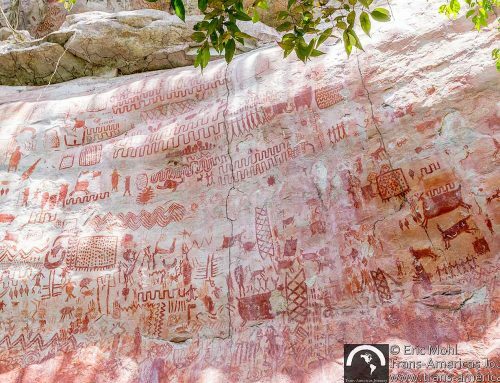 This is very nice content with beautiful images and very interesting information for us. So thank you for sharing. Hi Samuel – Yes. Ro-Ro (short for roll on / roll off) is another shipping option. However, that method comes with its own challenges including theft in transit.